I made a demo featuring background music that goes through the whole course (doesn't change from slide to slide). The user can chose from four songs to listen to and can adjust the volume, and the song continues playing through every slide and loops when it completes. I've also added instructions on how to make this work to the module. I don't know whether someone else has already posted something like this (I couldn't find anything), but hey if so here's one more! I've put together a second demo that shows a different way to do this. This second version performs the same actions as the first one, but without needing to edit the output files every time you publish! It saves a lot of headaches when you need to edit something in the course because now you don't have to drop the music files into the output folder and you dont have to edit the html file every time you publish! 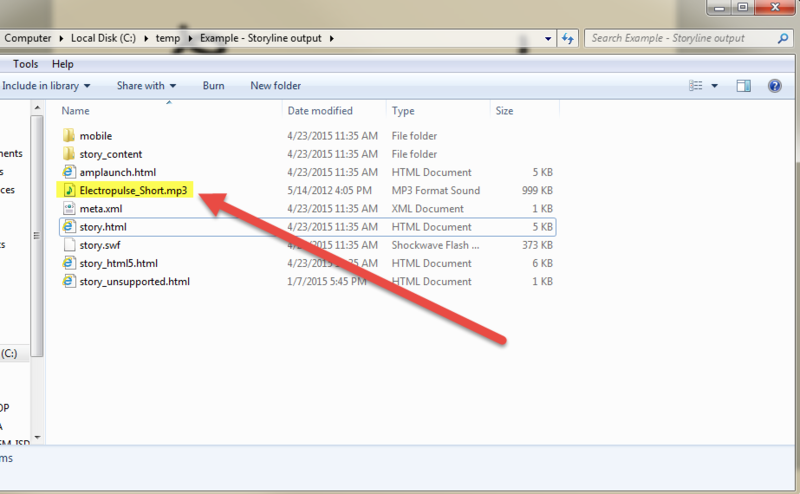 I've also attached the second version .story file. Its called Background_Music_Version_2.story. Thanks for sharing this Jackson! Any help you can provide would be greatly, GREATLY appreciated! To your story.html file, where "BrightlyFancy.mp3" is the name of the audio file you'd like to play. Don't forget to add your audio file to the root of your output folder or else your course wont be able to find your audio file. Thank you so much, Jackson! Would it work differently if it is published for an LMS? It works well when published for CD, but once I publish it in LMS form, zip the file, and then plug it into our LMS (Moodle), it doesn't work anymore. I hope that is at least a little accurate and helps get it to work in the LMS. If anyone has any real experience with this and can help out it would be much appreciated! This is so great Jackson, thanks so much for sharing! A BIG Thank You, Jackson. I have a nursing course with many StoryLine components, include a separate References and Credits module. Adding background music to each slide just didn't sound right. However, your solution makes it much more professional sounding. For anyone interested, you can see the final results here. Another BIG THANK YOU Jackson! I followed your instructions and it worked beautifully. On my first attempt I was using an .m4a file which didn't work. When I converted it in iTunes to an .mp3 file, it worked like a charm. Thanks again!! Yeah, unfortunately the <Audio> tag only supports mp3, wav, and ogg files. Glad this was able to help you guys! I've updated the original post to include a second method of getting background music to play. This new version doesn't require that you drop the music files into the output folder or edit the html file every time you publish. Saves a lot of time when trying to publish the course! I'm new here and not very familiar with JS or HTML. I've published my Storyline project for an LMS and when I open the story.html file to add the code, there's nothing in the file. Sorry to sound so dense, but what am I doing wrong? Could you provide a screenshot of the issue or your .story file? It is odd that your story.html file is empty, what program are you trying to open it in? I'm publishing it for an LMS as a zip file. 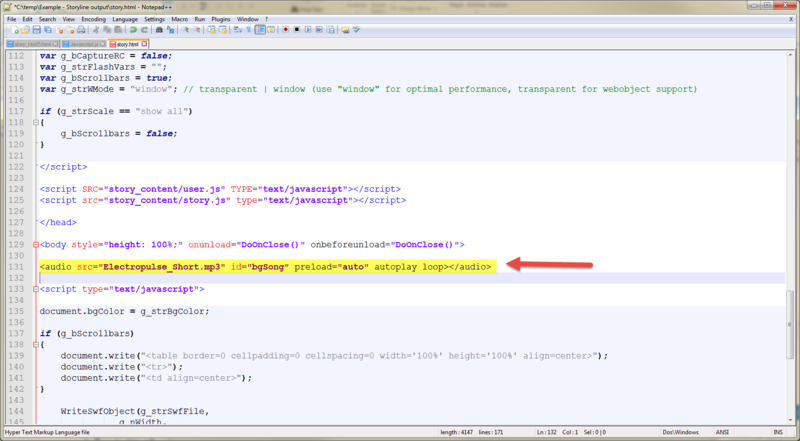 It says it's a Chrome HTML document, but when I open it the document is blank. Here's a screen shot of the files. Thanks Jackson. You'll need to upload all the files within the published output to your LMS to test it. Testing published content locally could cause elements of the content to fail as detailed here. If you're not ready for it to be live in your LMS, I'd suggest using SCORM Cloud as a testing platform as it's an industry standard for testing SCORM content. "Hi Marcee, Since opening the html document is causing you problems..."
"The reason I set up the audio.src="BrightlyFancy.mp3" was because I..."
"Hi Jane, It is possible to stop the music and resume it while the ..."
How can I make a background music play continuously across multiple slides/layers?